Showing the effect in brief. Published by a well-wisher to peace, for the information of all persons subject to the violation of the said Laws. Printed by Robert White, and are to be sold by him at his house in Warick Lane in Warick Court. 1661. His Majesty having been pleased by his Proclamation lately published to declare his Royal pleasure, concerning the observation of Lent and fish-days, at all other times in the year ; the observation of which of late years hath not been practiced, by reason of which, many persons are unacquainted with the Laws in those cases, the knowledge of which is of general concernment unto all ; I have therefore collected together so much of all the several Statutes that are in force for the observations of the said days and time as concerns this business. The first Statute you have wholly, the others not wholly, but in part ; in which these things be intermixed amongst other things. Knowing that all men have not the Statutes at large, therefore for the information of such as have them not, I have made this collection, that they may be acquainted with the Laws in this case, and avoid the penalties therein contained ; if any may be cautioned hereby, so as to prevent their sufferings, I shall be heartily glad, as having the end answered, for which I have taken upon me to publish the same. Statute : 2. & 3. Edw. vi. c. xix. Anno secundo & tertio Edwardi sexti. 2. & 3. Edw 6. Cap. XIX. Eating of flesh on certain days and times, forbidden. Yet forasmuch as divers of the King’s Subjects, turning their knowledge therein to satisfy their sensuality, where they should thereby increase in virtue, have of late time more than in times past, broken and condemned such abstinence which hath been used in this Realm, upon the Fridays and Saturdays, the Ember days, and other days commonly called Vigils, and in the time commonly called Lent, and other accustomed times : the King’s Majesty considering, that due and godly abstinence is a means to virtue, and to subdue men’s bodies to their soul and spirit, and considering also that Fishers, and men using the trade of living by fishing in the Sea, may thereby the rather be set on work, and that by eating of fish much flesh shall be saved and increased, and also for divers other considerations and commodities of this Realm : doth ordain and enact, with the assent of the Lords spiritual and temporal, and the Commons in this present Parliament assembled, and by the authority of the same, that all manner of Statutes, Laws, Constitutions, and Usages, concerning any manner of fasting or abstinence from any kinds of meats, heretofore in this Realm made or used, shall from the first day of May next ensuing, lose their force and strength, and be void and of none effect. And also that no person or persons, of what estate, degree, or condition he or they be, shall at any time after the said first day of May in the year of our Lord God 1549, willingly and wittingly eat any manner of flesh, after what manner of kind or sort it shall be ordered, dressed, or used, upon any Friday or Saturday, or the Ember days, or in any other day in the time commonly called Lent, nor at any such other day as is or shall be at any time hereafter commonly accepted and reputed to be a fish day, within this Realm of England wherein it hath been commonly used for to eat fish and not flesh : upon pain that every person eating any manner of flesh upon any of the said days or times prohibited by this Act, to forfeit for the said first offence, ten shillings of lawful money of England, and also to suffer imprisonment, by the space of ten days, and during the time of his or her said imprisonment, to abstain from eating of any manner of flesh. And if any person after he shall be lawfully convicted of any offence contrary to this Act, doth again offend contrary to this Act, and be thereof lawfully convicted, that then every person so offending the second time, shall for his second offence forfeit twenty shillings of lawful money of England, and also suffer imprisonment by the space of twenty days, and during the time of his or her said imprisonment, to abstain from eating of any manner of flesh, and so, like pain and imprisonment as often as he or she afterwards shall offend. And furthermore, it is ordained and enacted by the authority aforesaid, that Justices of Gaol Delivery, and Justices of Peace, in all and singular Counties, Cities, Towns corporate, and other places within this Realm of England, and other the King’s Dominions, shall have full power and authority to enquire, hear and determine all manner of offences that shall be committed or done contrary to this Act, in like manner and form as they may enquire, hear, and determine any trespass or other offence against the King’s peace committed or done, within the limits or place where they then shall be Justices of Gaol Delivery or Justices of Peace. And the half of every such forfeiture, shall be extracted into the Court of the Exchequer, in like manner and form, as fines for any trespass or other offence committed against the King’s peace ought or should be extracted : and the other half of the said forfeiture shall be to him that will sue for the same, by bill, plaint, information, or otherwise, in any of the King’s Courts of record, in which no excuse, protection, or wager of law shall be allowed. Provided always, and be it ordained and enacted by the authority aforesaid, that this Act or any thing therein contained, shall not in any way extend to any person or persons that heretofore hath, or hereafter shall have obtained any licence of our Sovereign Lord the King, his Heirs or Successors ; nor to any person being in great age and in debility and weakness thereby ; nor to any person being sick or notably hurt, without fraud or conspiracy during the time of his or her said sickness ; nor to any woman being with child or lying in child bed, for eating of such one kind of flesh as she shall have great lust unto ; nor to any person being in prison for any other offence than for any offence contrary to this Act ; neither to any that is or hereafter shall be the King’s Highness Lieutenant, Deputy or Captain of any his Majesty’s Army, Hold or Fortress : but the same themselves may eat flesh, and license their soldiers to do the same in times prohibited, upon the want and lack of other kind of food : neither shall it extend to St. Lawrence eve, St. Mark’s day, or any other day or eve being abrogated, neither to any such as heretofore have obtained any licence, in due form of the Archbishop of Canterbury. And further, be it enacted by authority aforesaid, that all Archbishops, Bishops, Archdeacons, and their Officers, or the Officers of any of them, shall have power to enquire of the offenders in the premises, and present the same to such from time to time, as by virtue of this Act have authority to hear and determine the same. Provided always, and be it enacted, that no manner of person or persons be impeached, molested or troubled, or shall incur any pain, penalty or forfeiture for any offence contrary to the Act above rehearsed, committed or done, except he or they be accused, convented or indicted, of and for the said offence, according to the tenour of this statute, within three months next after the committing of the said offence. Statute : 5. & 6. Edw. vi. c. iii. Anno quinto & sexto Edwardi sexti. 5. & 6. Edw. 6. Cap. III. Which shall be the Fasting days. And it is also enacted by the authority aforesaid, That every eve or day next going, before any of the aforesaid days of the Feasts of the Nativity of our Lord, of Easter, of the Ascension of our Lord, Pentecost, of the Purification, and the Annunciation of the aforesaid blessed Virgin, of All Saints, and of all the said Feasts of the Apostles, ( other than of St. John the Evangelist, and Philip and Jacob ) shall be fasted, and commanded to be kept and observed ; and that no other eve or day shall be commanded to be fasted. And it is enacted by the authority abovesaid, that it shall be lawful to all Archbishops and Bishops in their Dioceses, and to all others having Ecclesiastical or Spiritual jurisdiction, to enquire of every person that shall offend in these premises, and to punish every such offender by the Censurers of the Church, and to enjoin on him or them such penance, as shall be to the Spiritual Judge by his direction thought meet and convenient. Provided always, that this Act, or any thing therein contained, shall not extend to abrogate or take away the abstinence from flesh in Lent, or on Fridays and Saturdays, or any other day which is already appointed so to be kept by virtue of an Act made and provided in the third year of the reign of our Sovereign Lord, the King’s Majesty, that now is ; saving only of those evens or days, whereof the holy day next following is abrogated by this Statute, anything above-mentioned to the contrary in any way notwithstanding. Provided also, and it is enacted by the authority aforesaid, that when and so often as it shall chance for any of the said Feasts, ( the evens whereof be by this Statute commanded to be observed and kept as fasting days ) to fall upon the Monday : that then, as it hath always been heretofore accustomably used, so hereafter the Saturday then next going before any such Feast or Holy day, and not the Sunday, shall be commanded to be fasted for the eve of any such Feast or Holy day ; anything in this Statute before-mentioned or declared to the contrary in any way notwithstanding. Provided always, and it is enacted by the authority aforesaid, that it shall be lawful to every Husbandman, Labourer, Fisherman, and to all and every other person and persons of what estate, degree, or condition he or they be, upon the Holy days aforesaid, in Harvest, or at any other times in the year, when necessity shall require, to labour, ride, fish, or work any kind of work, at their free wills and pleasure, anything in this Act to the contrary in any way notwithstanding. Statute : 5. Eliz. c. v.
Constitutions for the maintenance of the Navy, &c.
Be it further enacted, that from the Feast of St. Michael the Archangel, in the year of our Lord God 1564, every Wednesday in every week throughout the whole year, which heretofore hath not by the laws or customs of this Realm been used and observed as a fish day, and which shall not happen to fall in Christmas week, or Easter week, shall be hereafter observed and kept as the Saturdays in every week be or ought to be. And that no manner of person shall eat any flesh on that day, otherwise than ought to be upon the common Saturday. And be it further enacted by the authority aforesaid, for the benefit and commodity of this Realm, to grow as well in maintenance of the Navy as in sparing and increase of flesh victual of this Realm : that from and after the Feast of Pentecost next coming, it shall not be lawful to any person or persons within this Realm to eat any flesh upon any Wednesday now newly limited to be observed as fish day, upon pain that every person so offending herein, shall forfeit three pound for every time he or they shall offend, or else suffer three months close imprisonment without bail or mainprise. And every person or persons within whose house any such offence shall be done, and being privy or knowing thereof, and not effectually publishing or disclosing the same to some public Officer having authority to punish the same, for every such offence to forfeit forty shillings. All which forfeitures for not abstaining from meats shall be divided into three equal parts : That is, one part to the use of the Queen’s Majesty, her heirs or successors ; the other part to the Informer ; the third to the common use of the Parish where the offence is or shall be committed ; and to be levied by the Churchwardens after any conviction in that behalf. Provided always, and be it enacted, that this Act or anything herein contained concerning eating of flesh, shall not in any way extend to any person or persons, that shall hereafter have any special licence, upon causes to be contained in the same licence, and to be granted according to the laws of this Realm in such cases provided. All and every which said licence and licences, shall be void to all intents, unless the same contain the conditions hereafter mentioned : That is to say, every licence made to any person or persons being of the degree of a Lord of Parliament or of their wives, shall be upon condition, that every such person so to be licenced, shall pay to the poor men’s box within the Parish where they shall dwell or remain, in the Feast of the purification of the blessed Virgin Mary, or within six days after the same Feast, six and twenty shillings and eight pence ; the same to be paid within one month next after the same Feast, upon pain of forfeiture of every such licence. And every licence to any person of the degree of a Knight or a Knight’s wife, shall be upon condition that every such person so licenced shall pay yearly thirteen shillings and fourpence, to the use aforesaid, and in form afore-mentioned. And every licence to any person or persons being under the degrees above said, shall be upon condition, that every such person so licenced, shall pay yearly six shillings and eight pence to the said use, and in form afore-mentioned. Provided always, that no licence shall extend to the eating of any Beef at any time of the year, nor to the eating of any Veal in any year, from the Feast of St. Michael the Archangel, unto the first day of May. Provided also that all persons which by reason of notorious sickness shall be enforced for recovery of health to eat flesh for the time of their sickness, shall be sufficiently licenced by the Bishop of the Diocese, or by the Parson, Vicar or Curate of the Parish where such person shall be sick ; or of one of the next Parish adjoining, if the said Parson, Vicar, or Curate of his or their own Parish be willing ; or if there be no Curate within the same Parish. Which licence shall be made in writing signed with the hand of the Bishop of the Diocese, or of the Parson, Vicar, or Curate, and not endure longer than the time of the sickness. And that if the sickness shall continue above the space of eight days after such licence granted, then the licence shall be registered in the Church book with the knowledge of one of the Churchwardens, and the party licenced shall give to the Curate four pence for the entry thereof, and that licence to endure no longer, but only the time of his, her, or their sickness. And if any licence by any Parson, Vicar, or Curate, be granted to any person or persons, other than such as evidently appear to have need thereof, by reason of their sickness : not only every such licence shall be void, but also every such Parson, Vicar, or Curate, shall forfeit every such licence otherwise granted, five marks. Provided also, and be it enacted, that all licences heretofore granted to any subject of this Realm, by any of the late Kings, or by the late Queen Mary, or by the Queen’s Majesty now being, or by any Archbishop of this Realm, having authority so to do, shall be of as good force in Law for the Wednesday now limited, and other accustomed fish days, as they were before the making of this Act, for the said other accustomed fish days ; so as the parties licenced do hereafter observe all such conditions as limited in this statute, to such as shall hereafter obtain any licences. And such persons also, as heretofore were or ought to be licenced by reason of age or other impediment or cause, by order of the Ecclesiastical Laws, shall enjoy the same privilege and accustomed licences : anything in this Act to the contrary hereof, in any way notwithstanding. And if any person or persons shall be presented before the said Judges, Justices or Officers within the limits of their authorities, or any information be given to them of any offender of this Act, that then they shall have full power and authority upon any such presentment or information, to make process against the offenders of this Act, as is commonly used upon indictments of trespass. And if any be presented, and afterward be convicted, by confession or otherwise, that then every such person shall suffer no less forfeiture or punishment than herein is above limited : all which forfeitures to be levied in manner and form following. That is to say, such forfeitures concerning eating of flesh as are above limited to certain uses, to be to the same uses in that behalf above expressed, and all such forfeitures as according to the tenour of this Act shall be determinable before the said Judges, Justices, or other Officers of the Admiralties aforesaid, or before Commissioners of Oyer and Terminer ; in that behalf, shall be to the use of the Lord Admiral of England, or Lord Warden of the Cinque Ports, where such offence shall be presented, or whereas the jurisdiction of the cause shall appertain. And all such forfeitures, as according to the tenour of this Act shall be determinable before Majors, Sheriffs, Bailiffs, or other head Officers of Cities or Towns corporate, shall be to the common use of the Corporation of the said City or Town corporate, where such offences shall be presented, or where the jurisdiction of the cause shall appertain. And all such forfeitures, as according to the tenour of this Act shall be determinable before the Justices of the Peace, shall be to the use of the Queen’s Majesty, her Heirs and Successors. And if any person shall be convicted, by confession or otherwise, upon any information made by any person or persons, against any offender or offenders of this Act, in any cause ( save for the eating of flesh first above specially limited ) that then every such person so convicted upon any information, shall lose such forfeiture as is above limited, the one half to such as shall make the information, and the other half to those which upon presentment without special information are above limited to have the whole forfeiture. And that for the levying of every forfeiture growing by this statute, as well the said Lord Admiral of England, Lord Warden of the Cinque Ports, their Lieutenants and Judges, as the said Justices, Mayors, Sheriffs, Bayliffs and other head Officers within the limits of their Commissions or authorities, have and shall have full power and authority to make such process, as they shall think good by their discretions. Provided always, that no information at the suit of any person concerning this Act, shall be of any effect to put any person to answer or loss of forfeiture, except the said information be commenced within half a year next after the offence done contrary to this Act ; nor that any information, or presentment for the Queen’s Majesty, her Heirs or Successors, or for the Admiral, Warden of the Cinque Ports, Mayors, or other Officers aforesaid, be of any effect to put any person to any answer or loss of any forfeiture by virtue of this Act, except the said information or presentment be within one year next after the offence done and committed contrary to this Act. Provided and be it likewise enacted, that it shall be lawful to any person or persons, to have at his or their table, upon every Wednesday, being ordered by this statute to be observed as a fish-day, one only usual competent dish of flesh, of one kind and no more, so that he, she, or they have also served to the same table, and meat at the same meal, three full competent usual dishes of Sea-fish, of sundry kinds, either fresh or salt, and that without fraud or conspiracy, and so shall also order, that the same fish be meet and seasonable, and that it shall be eaten or spent in like manner, as upon Fridays or Saturdays in like case are used. And also such persons as have, or hereafter shall have, upon good and just consideration, any lawful licence to eat flesh upon any fish day ( except such persons, as for sickness shall for the time be licenced by the Bishop of the Diocese, or by their Curates, or shall be licenced by reason of age or other impediment, allowed heretofore by the Ecclesiastical laws of this Realm ) shall be bound by force of this Statute, to have for every one dish of flesh served to be eaten at their table one usual dish of Sea-fish fresh or salt, to be likewise served at the same table, and to be eaten or spent without fraud or conspiracy, as the like kind is or shall be usually eaten or spent on Saturdays. And that these two Articles and clauses next above, shall be taken and interpreted from time to time, in the favour of expense of Sea-fish, and that the offender or offenders herein, shall be punished in like manner, as is ordered by this statute, for punishment of such as shall eat flesh upon Fridays, Saturdays, or other fish days. And because no manner of person shall mis-judge of the intent of this statute, limiting orders to eat fish and to forbear eating of flesh, but that the same is purposely intended and meant politickly for the increase of Fishermen and Mariners, and repairing of Port Towns and Navigation, and not for any superstition to be maintained in the choice of meats. Be it enacted, that whatsoever shall by preaching, teaching, writing, or open speech notify that any eating of fish, or forbearing of flesh mentioned in this Statute, is of any necessity for the saving of the soul of man, or that it is the service of God, otherwise than as other politick laws are and be, that then such person shall be punished, as spreaders of false news are and ought to be. This Act to continue and endure to the end of the next Parliament, 3. Caroli Cap. 4. continued until the end of the first session of the next Parliament. The punishment of such persons as are spreaders of false news, by the Sta. 3. Ed. I. 33. 2. Rich. 2. 5. 12. Rich. 2. II. which is to be kept in prison while they produce their Authors. Statute : 35. Eliz. c. vii. A branch of the Statute of Anno 35. Reginae Eliz. Cap. 7. entitled, Several Statutes made in the reign of King Hen. 8, King Edw. 6, and Queen Eliz. revived and continued, and certain other Statutes repealed, &c.
In which Statute among other things, it is provided and enacted as followeth. Provided also, and be it enacted by the authority aforesaid, that every person eating any flesh upon any fish days, contrary to the form of the said Statute made for the maintenance of the Navy, shall forfeit only twenty shillings, or else suffer only one month’s close imprisonment without bail or mainprise. And every person or persons within whose house any such offence shall be done, and being privy or knowing thereof, and not effectually publishing or disclosing the same to some public officer having authority to punish the same, for every such offence to forfeit only thirteen shillings four pence, anything in the said Statute contained to the contrary notwithstanding. Statute : 3.Carol. c. iv. A branch of the Statute of Anno 3. Caroli Cap. 4. entitled, Diverse Statutes made perpetual, others continued, and some others repealed, when corn may be transported, &c.
And so much of an Act made in the fifth year of the reign of the late Queen Elizabeth, entitled, An Act touching certain politick constitutions made for the maintenance of the Navy, as is not repealed by any later Statute, nor doth concern the eating of flesh or using of fish upon the Wednesday, nor the transportation of herring or other Sea-fish, nor freedom of Subsidy, Custom, or Tonnage for the same, nor transportation of Corn, nor the prohibiting the bringing into this Realm any Cod or Lings in Barrels or other Casks, together with all and every other additions, explanations, and alterations made thereunto or thereof, or of any part thereof by any Statute or Statutes made since the making of the said last mentioned Act, and in force the last day of the Session of Parliament that was in the 21. year of the reign of the late King James, shall continue in force until the end of the first Session of the next Parliament. A branch of a Statute made Anno 17. Caroli Regis, entitled, An Act for the further relief of his Majesty’s army and the Northern parts of the Kingdom. In which Statute among other things, it is provided and enacted, as followeth. Provided and be it enacted by the authority aforesaid, that the passing of this present Act, or of any other Act or Acts, or his Majesty’s Royal assent to them, or any of them in this present Session of Parliament, shall not be any determination of the said Session. And that all Statutes and Acts of Parliament made in the third year of the reign of his Majesty that now is, entitled, An Act for the continuance and repeal of diverse Statutes, continued until the end of the first Session of the next Parliament, shall by virtue of this Act be adjudged ever since the Session of Parliament in the said third year, to have been of such force and effect as the same were the last day of that Session, and from thenceforth ; until some other Act of Parliament be made touching the continuance or discontinuance of the said Statutes and Acts in the said Act of the third year of his Majesty’s reign, continued as aforesaid. Primary: ed. of 1661 (London). Secondary, v1: ed. of 1661 (London). Secondary, v2: ed. of 1661 (London). 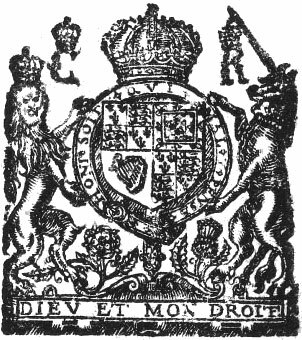 Royal Seal of Charles II: a 1660 royal edict. Statute : 2. & 3. Edw. vi. c. xix. Statute : 5. & 6. Edw. vi. c. iii. Statute : 5. Eliz. c. v. Statute : 35. Eliz. c. vii. Statute : 3. Carol. c. iv. Statute : 17. Carol.